This is a telescope mirror, but it isn't exactly solid. The thin film of silver that creates the reflective surface is really floating over ionic liquid which is unevaporating. Ionic liquid is basically molten salt that doesn't crystallize or dry up. The mirror is spun which evenly, distributes the silver on the parabolic-shaped surface. The liquid surface is perfect for the moon which has little ground disturbance. The lack of air will also make the smooth surface free of pollutants. Changes in temperature will also not affect the quality of the reflected image as the silver would just go back to its original state. 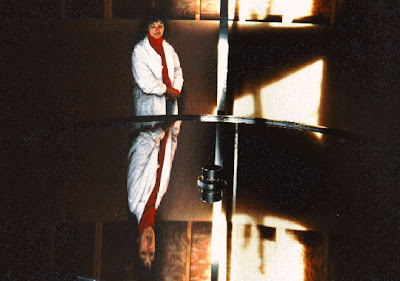 The mirror is made by scientists from the University of British Columbia led by Ermanno Borra.